Did you know that dietary and exercise factors affect age-related macular degneration (AMD) incidence and progression by reducing oxidative stress? Low consumption of fish, vegetables, and antioxidants including vitamin C, vitamin E, and zinc are associated with increased risk of AMD. Low consumption of carotenoids, particularly lutein and zeaxanthin- both found in green leafy vegetables, is also associated with an increased risk of AMD. Did you know that the retina has the highest rate of metabolism in the body and consumes the most oxygen? It’s true – which means the retina needs to be resupplied with nutrients every day to function at its best. The macular pigment of the retina is composed of lutein and zeaxanthin and the highest amount of these nutrients are found in the inner layers of the fovea and rod outer segments of the retina. In addition, omega- 3 fatty acids function as antioxidants by protecting ocular cells against light, oxygen, and damage to the eyes. 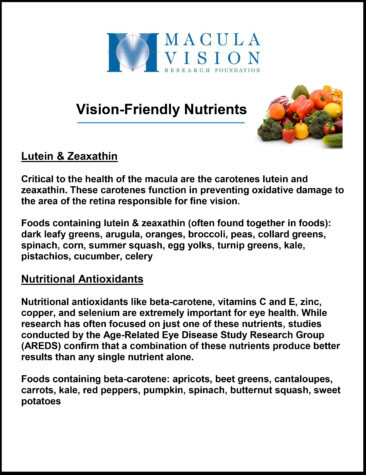 Critical to the health of the macula are the carotenes lutein and zeaxathin. These carotenes function in preventing oxidative damage to the area of the retina responsible for fine vision. 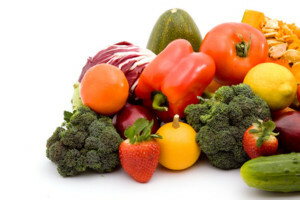 Foods containing lutein & zeaxathin (often found together in foods): dark leafy greens, arugula, oranges, broccoli, peas, collard greens, spinach, corn, summer squash, egg yolks, turnip greens, kale, pistachios, cucumber, celery. Nutritional antioxidants like beta-carotene, vitamins C and E, zinc, copper, and selenium are extremely important for eye health. While research has often focused on just one of these nutrients, studies conducted by the Age-Related Eye Disease Study Research Group (AREDS) confirm that a combination of these nutrients produce better results than any single nutrient alone. You can find macular degeneration vitamins, AREDS2 Formula, in your local pharmacy. Omega-3 fatty acids from fish oils play an important role in eye health as well. 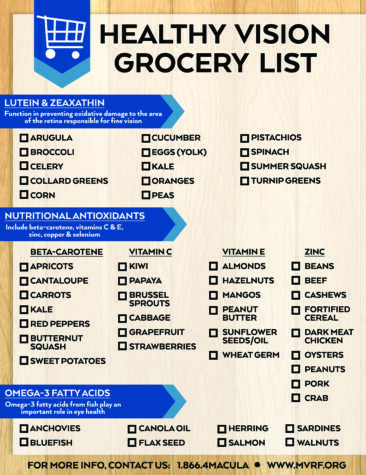 Download our healthy vision shopping list to take with you to the supermarket! Download and print this information so that it is easily accessible! This information does not provide, and is not a replacement for, professional medical evaluation, advice, diagnosis, or treatment. 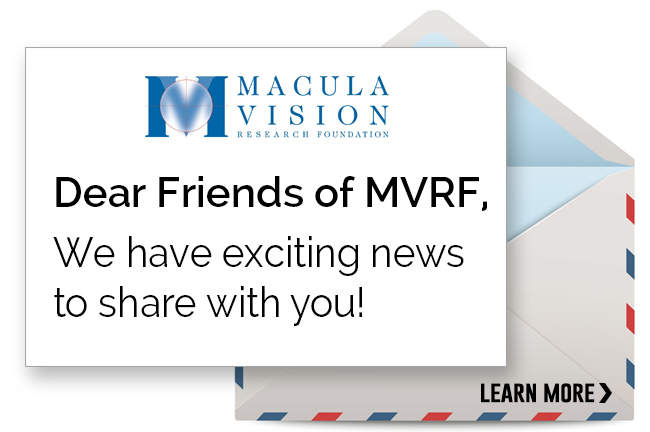 MVRF makes no guarantee or representation about the accuracy or completeness of this information.